Testosterone Centers of Texas (TCT), one of the leading testosterone clinics in the DFW area, is opening a new clinic for the medical treatment of Low T in the Flower Mound area. Located near The Shops at Highland Village, just a few minutes down the road from Barnes & Noble, the new Low T clinic in Flower Mound will open in late December/early January and will offer comprehensive testosterone replacement therapy for men and women who suffer from low testosterone (Low T). Like TCT’s other Low T centers in Hurst, Frisco, and Lewisville, the new clinic will mostly focus on the treatment of Low T. Flower Mound residents will also gain access to ancillary medical therapies and referral services. For the last 5 years, Testosterone Centers of Texas has been helping men and women with low testosterone in the DFW area, correcting patient hormone levels to normal ranges and developing long-term medical treatment plans. Each of TCT's clinics has licensed medical care providers who are experts in hormone replacement. Furthermore, each facility is overseen by a medical doctor to provide quality assurance and ensure excellence of care. All 4 founders collectively have more than 200,000 patient encounters, evaluating and treating both men and women who suffer from hormone deficiency; however, TCT specializes in the treatment of low testosterone. TCT is committed to going above and beyond for its patients, both in terms of the quality of the care provided and in terms of the quality of the customer service provided. Their focus on customer service and convenience has driven the opening of the latest clinic. 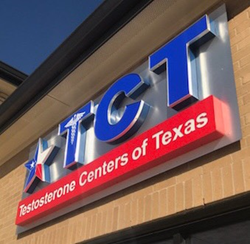 Joining their existing testosterone clinics, TCT’s new location is about as centralized as it can get in Dallas-Fort Worth. Located on the border between Flower Mound, TX Highland Village, TX and Lantana, TX and just 20 minutes from the Grapevine, Denton, Argyle, and Lake Cities areas, the new clinic will offer the same hormone replacement therapy that Testosterone Centers of Texas has provided their clients for the last 5 years. “We emphasize providing individualized testosterone replacement therapy in a safe, efficient, affordable manner,” says Dr. Young. Free Consultations and Low-Cost Testosterone Testing are available. TCT offers free consultations to anyone who thinks they may be suffering from low testosterone. Go to tctmed.com/free-low-t-consulatation to sign up for a free consultation. TCT also offers $25 Low T testing, regardless of insurance. Go to tctmed.com/testosterone-testing-25-dollar-low-t-test to sign up now. Testosterone Centers of Texas, a medical practice both owned and operated by medical professionals, comprises four clinics spread across the Dallas-Fort Worth metroplex. TCT focuses exclusively on treating hormone imbalances in both men and women, with a particular focus on treating low testosterone in both men and women. TCT has clinics in Lewisville, TX, Hurst, TX, Frisco, TX, and now Flower Mound, TX. To learn more, visit TCTmed.com.